Many seniors are prone to a number of illnesses. Some of which are chronic in nature. Neurological conditions like Parkinson’s disease, Alzheimer’s, pulmonary and cardiovascular illnesses. Balance poses a major problem to many seniors. The constraint in mobility experienced post surgeries and medications or treatments keeps them from performing day to day activities own their own. Physical injury is common in persons of old age due to improper balance, muscular dysfunction and weakness as well as weak joints and ligaments. Fragile and injury prone skeletal system adds to the woe as well. Developing balance and posture is crucial in this age for improving overall functionality. Standing on one foot, with hands firmly placed on a chair or support for ten seconds and then switching over to the other leg. Repeat this exercise 10 times. Walking heel to toe. Select a spot and move towards it with the heel of one foot nearly touching the toe of the other; walking in a b-line with one foot ahead of the other. Alternate legs for 20 steps in this exercise. Grip a chair for support and breathe in while slightly raising the leg sideways without bending the knees or toes. Hold this position for 10 seconds. Breathe out and bring the leg back to its original position. This exercise can be repeated for 10 to 15 times with both legs. 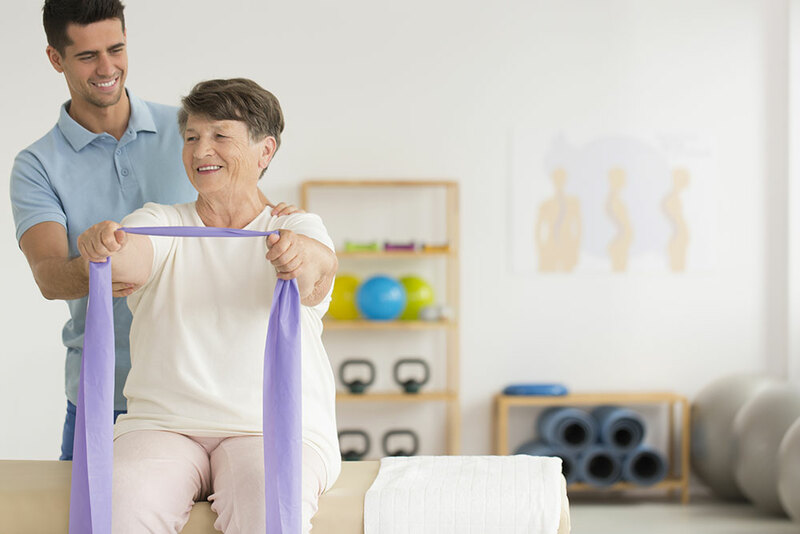 Physical therapy aids the senior population by supporting a healthy structural maintenance, enhancing flexibility, stabilizing mobility and developing a sense of strength and confidence to carry on with their everyday lives. Physical therapy has a huge role to play in both ensuring that the senior citizens recuperate well post illnesses and also helps to improve their overall agility and balance. Our therapists at Optimum Rehab in NYC make it their top priority to ensure the senior care here is customized to our clients to provide them the best service. It helps to attain improved mobility, helping seniors to get on with their day to day lives with ease. Physical therapists help in improving the retention of stability in elders, thereby reducing the chances of injury and re injury. Physical therapy can succeed in reducing the pain endured by the patients to a large extent and also in improving the overall endurance of the elderly. It helps in the quicker recovery and rehabilitation of the elderly, enabling them to be more independent in their daily lives. It helps to take away, to a large extent, the over dependence of the seniors on prescription drugs. Make it a lifestyle choice to stay fit and healthy with physical therapy at every age. And the senior care services provided by Optimum Rehab Physical Therapy in NYC will help to ensure strength and vitality! After all age is just a number!